To purchase prints just click on the "ADD TO CART" Button next to your favorite images. 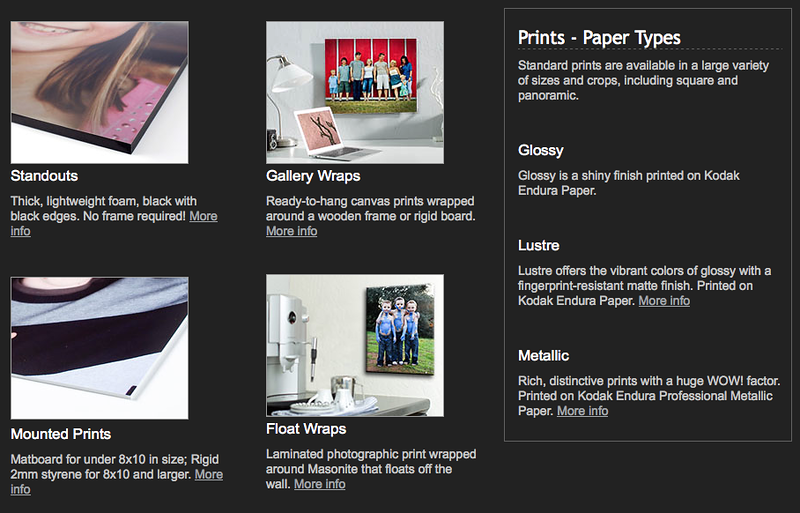 When you place an order you can choose size , paper type, and different products such as mounted pictures or canvas wraps. I recommend choosing a size that does not require cropping so that you get the full beauty of the picture. All you have to do is hover the mouse over the size you want and the picture to the left will show you if it needs cropping. AND just to be sure you are happy, Smugmug offers a 30 day satisfaction guarantee to make sure your prints look perfect! Here are samples of the products offered from my website. I have also partnered up with Goss Photo Lab out of Norwell, Ma for all of my personal printing and framing needs. These guys can do EVERYTHING when it comes to printing. If you live locally on the South Shore, prefer to support local business, or just don't see the product you want please send me an email- DrewLedermanPhotography@yahoo.com -with the image you would like printed and what size and I will have it printed at Goss Photo Lab.